Mahira Khan is a famous Pakistani model, host and actress. Her superb acting and astonishing beauty is the reason behind her fame in Pakistan and several other countries. She is ranked among those actresses that made their place in the Pakistani showbiz industry in the start of their career. She is especially known for her superb acting in hit dramas like “Humsafar, Sadqay Tumhare and Shehr-e-Zaat”. Apart from dramas, she has also performed in few Pakistani films like “Ho Mann Jahan, Bin Roye and Bol” where her performance was appreciated. 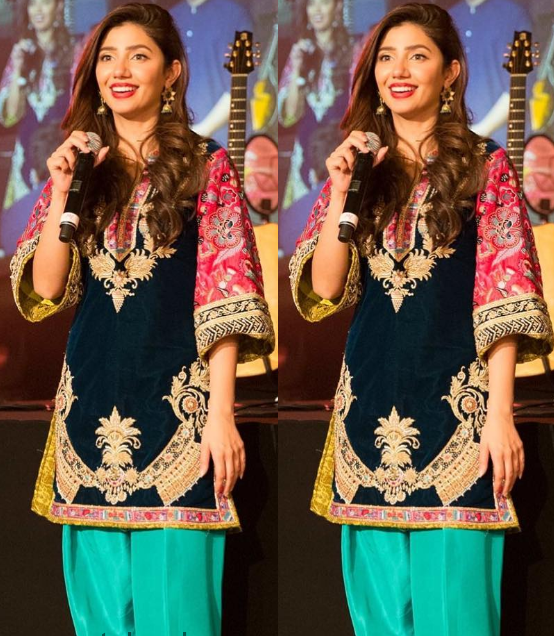 Currently, Mahira Khan was seen in a completely different style due to dying her hair beautifully. In these pictures, she is seen wearing different color contrast Afghani kurta along with silky shalwar of aquamarine color. Her makeup is also make her look astonishing.